This Greek Salad Dressing Recipe is made with easy to find ingredients and comes together quickly! It is delicious, simple, and so good on so many different salad recipes. I love it on my Greek Quinoa Salad. Meanwhile, I made you this amazing Greek Salad Dressing. It is delicious, tangy, and perfect. 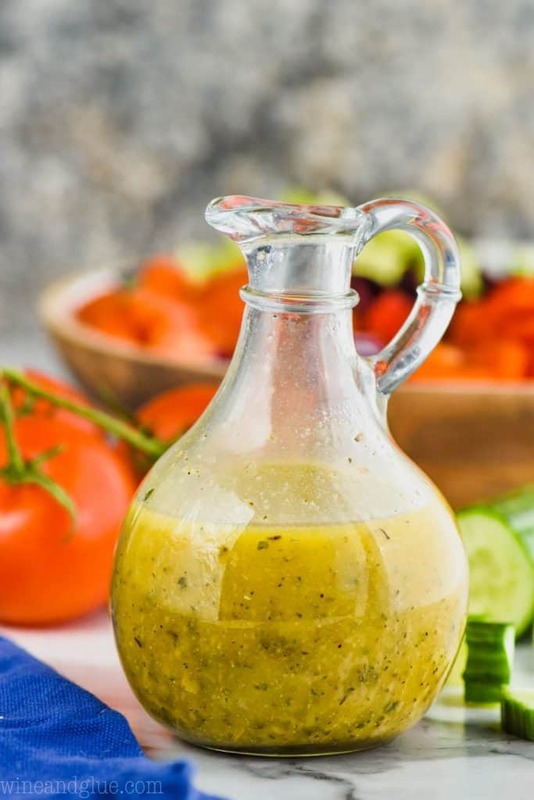 I love making homemade salad dressing recipes because it is so easy to adjust the flavor in them. I’ve made two versions of this recipe and I can’t decide which one I like more. I literally dipped lettuce in each version over and over and kept comparing them. One has a stronger red wine vinegar taste and one has a stronger olive oil taste. 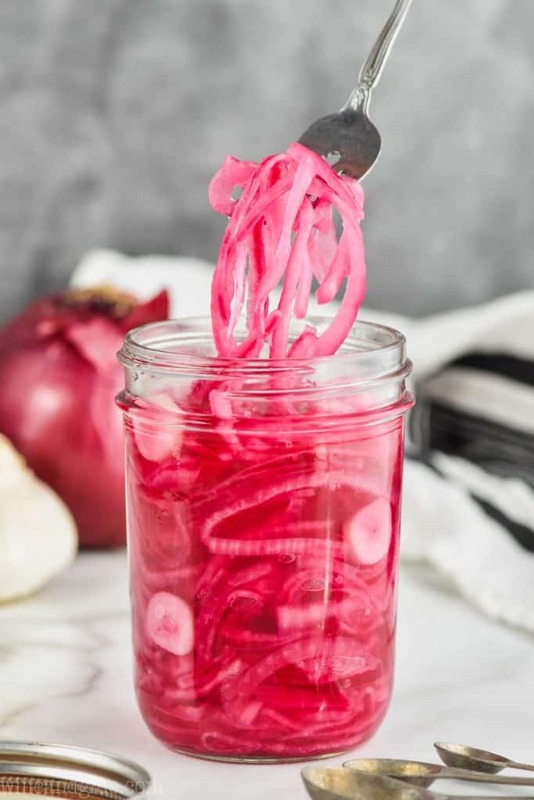 I love the red wine vinegar one (which comes from only adding a half cup of olive oil), but I know everyone isn’t obsessed with pickling things like I am. So in the recipe notes you will see that you can start out with only a half cup of oil and add more depending on your tastes. 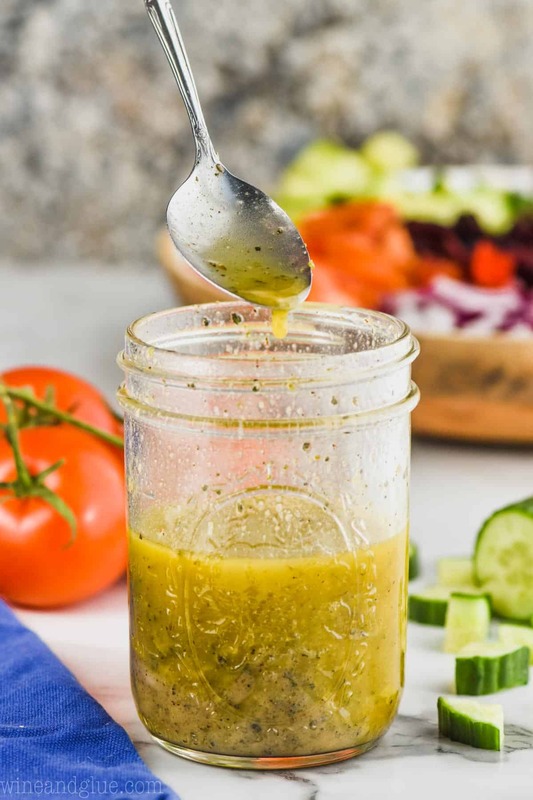 The herbs and seasonings in this dressing come together with the red wine vinegar and oil, to give it a rich and flavorful taste. 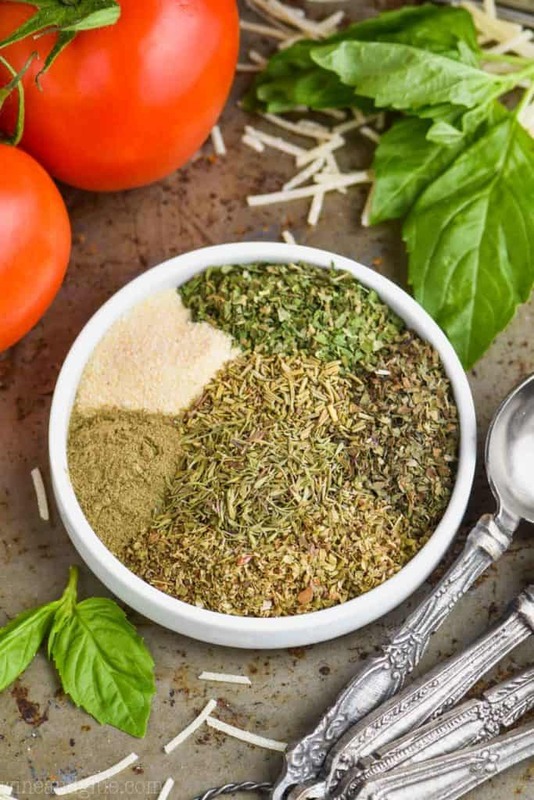 The oregano and garlic are perfect in this greek salad dressing. The mustard and lemon juice give just the right kind of tang. 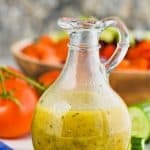 HOW LONG DOES GREEK SALAD DRESSING LAST? 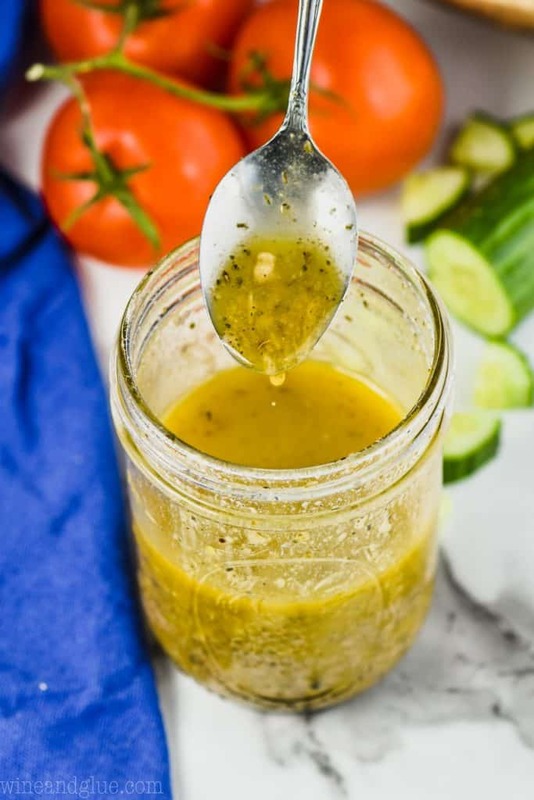 Any vinaigrette based salad dressing (dressings that don’t have yogurt or mayonnaise in them), can last about three months in the refrigerator. 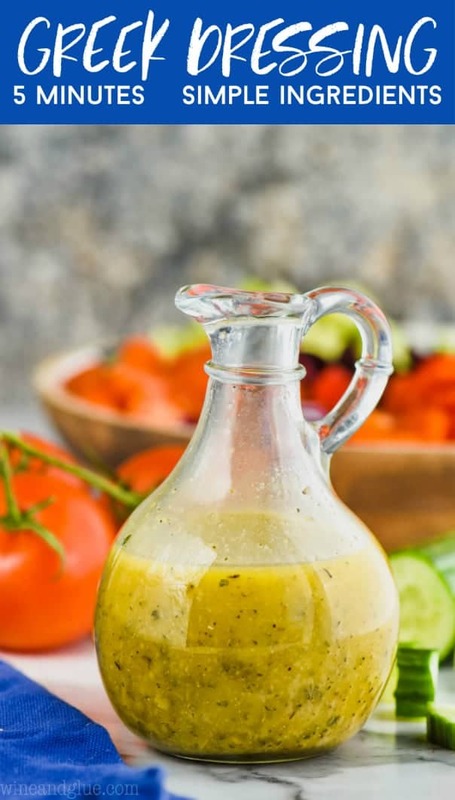 When you pull this greek dressing recipe out of the refrigerator to use it, you will need to bring it to room temperature and thoroughly shake it before dressing your salad. 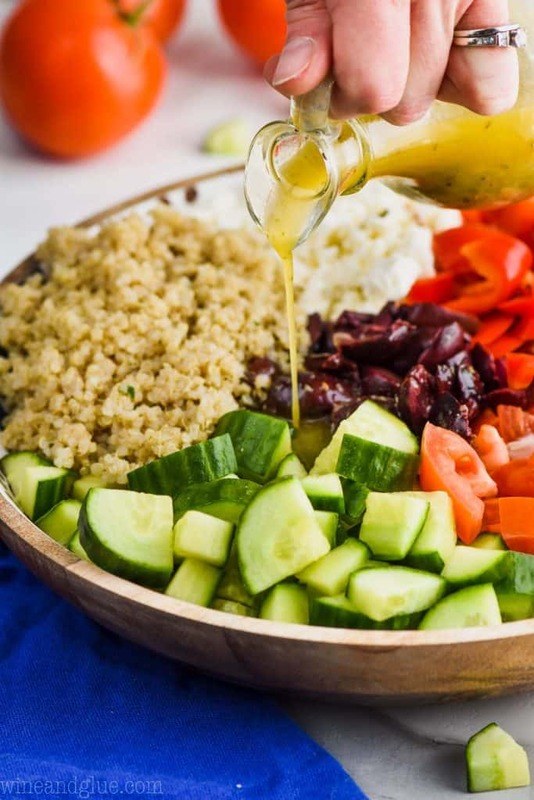 My favorite recipe to use this greek dressing on is my Greek Quinoa Salad. It would a great alternative dressing on this Greek Orzo Pasta Salad or this Cucumber Tomato Salad. 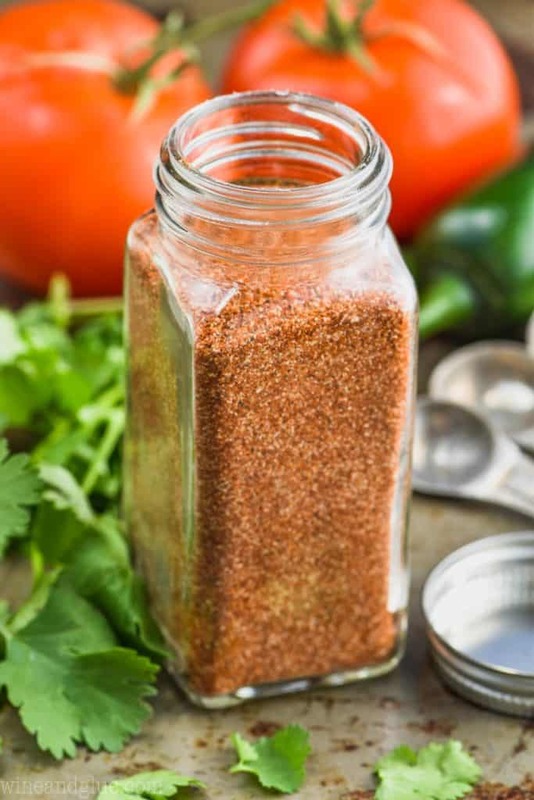 Combine all of the ingredients in a mason jar, put on the lid and shake well to combine. Store in the refrigerator, sealed, for up to three months. Bring to room temperature before using. If you like your dressing with a strong vinegar taste, cut olive oil back to 1/2 cup. 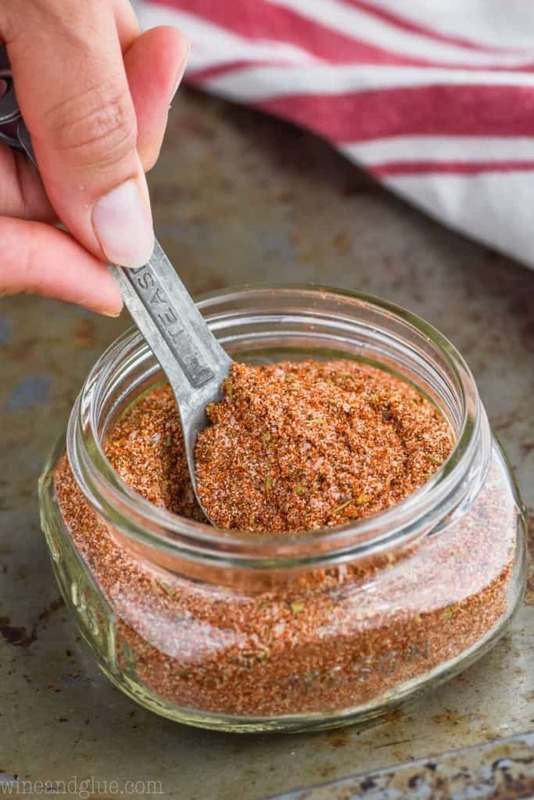 If you aren't sure, make it with 1/2 a cup, and then add up to 2 tablespoons more at the end to your taste. Conversion to imperial measuring units, please. The calorie notes are in now! This is NOT a complaint – I’ve noticed & enjoyed commercial Greek dressings that contain feta cheese. Yours doesn’t & I imagine you have good reason for the omission – what is it? I e, why wouldn’t crumbled feta be a good thing in this recipe? Well, I was adding it to a recipe that already had feta in it, so I thought I was good to go, lol. It also stays longer in the refrigerator without it. However, it would be pretty amazing with feta! Thanks for sharing. I really like that you included the shelf life. I didn’t know that vinaigrette without mayo and yogurt lasted that long when it’s homemade. Definitely learned something new today.